While most of the companies producing fatbikes are based in areas with, well, seasons, Felt Bicycles is located in Orange County, where winter is basically a month with a few clouds and a low of 60 degrees. 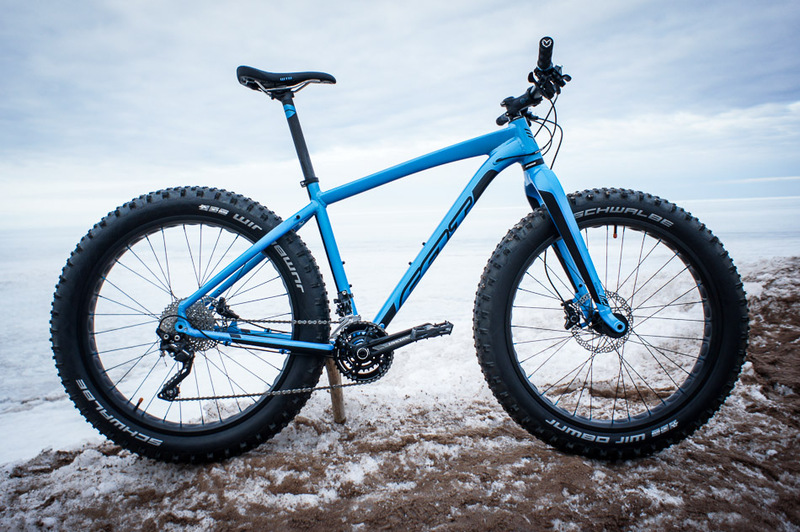 In spite of this, Felt's Double Double fatbike is definitely in the same league as the big hitters from cold-climate areas like Canada, Alaska, Minnesota, Colorado, or Wisconsin. And the Double Double still pays homage to its Southern California roots, its name likely a nod to the popular (and delicious) In-N-Out Double-Double cheeseburger. It's immediately obvious that Felt paid a great deal of attention to detail with the Double Double. The beautifully wide, 760-millimeter handlebars provide good leverage and handling control. Plus, they're carbon, which is a welcome feature: It might seem initially like that money spent on the bars would have been better allocated elsewhere, but carbon is much more comfortable than aluminum when the temperature dips below 15-degrees Fahrenheit and metal handlebars become wind-chilled icicles. The frame offers neat internal cable routing and plenty of spots to bolt on racks and fenders. The front and rear thru axles are also nice, as they help eliminate the additional flex that the heaver wheels can cause in corners. The only oddity was that Felt opted to go with no-name rims, which were drilled for Schrader valves–I'm not sure I've ever seen Schrader-valved fatbike tubes in any of the shops I frequent. This isn't a deal breaker, but rather a nit pick on an otherwise solid build, and Felt has made the switch to presta for future production runs. Overall the felt's geometry and overall setup, with its neutral-length stem, make for a well-balanced ride. The bike rallies descents, powers through flat singletrack and stays well poised on slow, slick, technical sections. 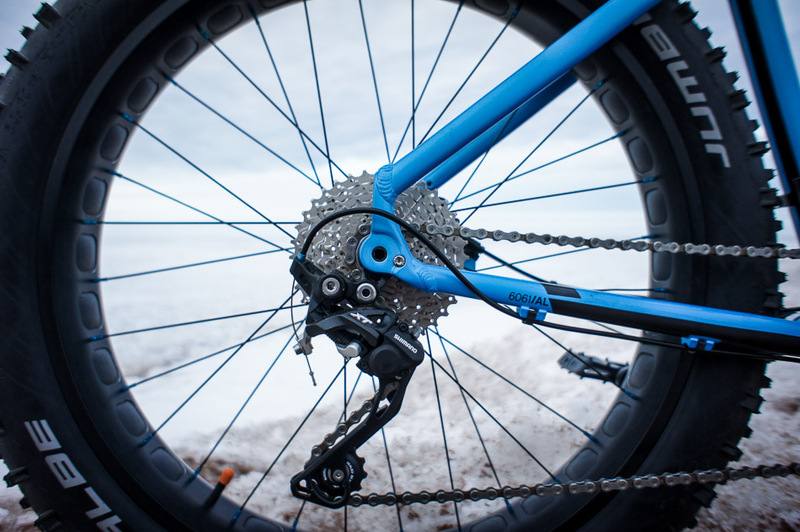 The Double Double comes equipped with Schwalbe's sub-1,000 gram, 4-inch Jumbo Jim tires, which offer a good ride quality on hard-packed snow, but loose ground to knobbier treads in softer conditions or in high-speed corners. On that note, the 455-millimeter chainstays are on the long-end of the spectrum for a 4-inch-tired bike. It appears there is ample room for larger rubber, perhaps up to 4.5 inches, but I didn't test the clearance. The long stays do slightly curb the Felt's quickness on tight, twisting trails, but in turn add stability on descents and help the bike stay on track during slippery, technical climbs. This is one trade-off that's definitely worth it on snow. 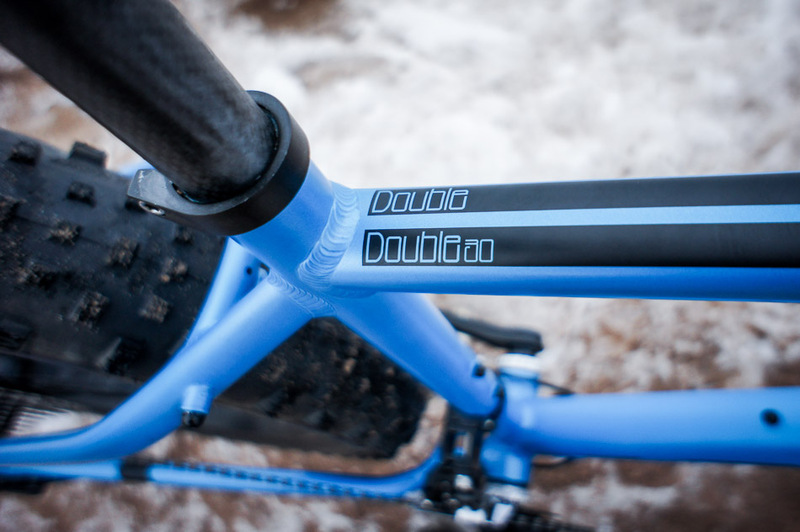 The Double Double 30 weighs in at a hair over 31 pounds, which is fairly competitive at this price point, but the lightweight, fast-rolling tires combined with the stiff chassis and solid geometry make the Felt feel a couple pounds lighter than what the scale says. Felt's Double Double 30 is a solid all-round fatbike that is well suited for just about any extra-fat-tire adventure that you can set your mind to, from a day of groomed singletrack riding, to racing, to overnight bikepacking adventures—as long as the terrain is relatively well packed. Much like the double cheeseburger that shares its name, it would be hard not to be satisfied with this southern-California born fatbike.